Sutton Park boasts a wide variety of wildlife. This page describes some of the main habitats and species. More detailed information, including checklists, can be found at the found at the , which is maintained through the . There is a wealth of interesting pondlife in most of the pools and streams. The laval stages of many insects, such as mosquitoes and damselflies, are often found on the underside of rocks and pebbles. These will later leave the water as adults and fly around the pools and marshes. Among the amphibians common in the pools are three species of newt: Great Crested, Palmate and Smooth Newt. Frogs and toads are also quite common but spend less time in water, although both come back to water to breed. Frogspawn is laid in clusters and toadspawn in long chains. Many other creatures, from microscopic algae to large fish, live in the pools and streams, so that this domain presents a fascinating world to study. Most of the pools support a wealth of plants in and around the water. Some plants, such as duckweed, float entirely on the surface and others such as water lily and reed have roots in the lake bed. Little Bracebridge Pool and the marsh at Longmoor Pool are particularly good for attractive plants. The bogs found along the valleys of the streams also have many fascinating species of plant, including three insectivorous plants: Bladderwort, which traps tiny animals in small sac-like leaves, and Butterwort and Round-leaved Sundew, which trap insects on their sticky leaves. Other attractive wetland flowers include Marsh Marigold, Ragged Robin, Marsh Violet, Yellow Flag, Water Mint and marsh orchids. 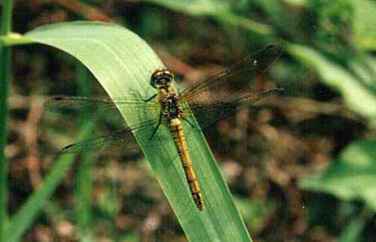 Insects particularly associated with water include dragonflies and damselflies. Some ten species of dragonfly have been found in the park, including the large Southern Hawker (Aeshna cyanea), as well as the delicate blue and red damselflies. All are quite harmless although sometimes alarming in appearance. Woodland has always been a dominant feature of Sutton Park, although more extensive at times in the past. It presently covers some 750 acres (180 hectares) of the park. Oak (Sessile and Pedunculate), Holly, birch (Silver and Downy) and Alder are native to the park, but other trees have been introduced, including Larch, Spruce, Pine, Lime, Horse Chestnut and Sweet Chestnut. Interesting smaller trees to look for are Crab Apple, Rowan (or Mountain Ash), Alder Buckthorn, Elder and the Wayfaring Tree. The woodland areas are the most populated of all the bird habitats within the Park. The variety of trees provides well for the varied life styles and feeding habits of different species. Woodland is home for the perching, sparrow-like birds (passerines), the majority of which are resident. The remainder are either migrants, or birds just passing through the park to breeding grounds or winter quarters. Among the most likely mammals to be seen in woodland, are Grey Squirrels and Hedgehogs which are quite common in Sutton Park. Carnivores such as Foxes, Stoats and Weasels are occasionally seen, and are partly responsible for keeping down the rodent population. Several species of shrews, voles and mice can be found. Pipistrelle and Long-eared Bats are quite common, but are less conspicuous and are only seen as night approaches. The woodlands provide an important habitat for many species of insect. The park contains predominantly broad-leaved trees, especially Silver Birch and oak, which support a large variety of insects such as sawflies, weevils, moths and bugs, the larvae of which feed on the leaves. Areas of the Park planted with conifers, such as Scots Pine and Larch, do not support a large insect fauna, but they do provide a habitat for a spectacular insect, the Giant Woodwasp. The Holly understorey is poor in insect fauna but it provides a home for a large population of the beautiful Holly Blue Butterfly. Of all the creatures on the heath, those living on the ground are the most secretive. This is necessary for their survival, since heathland offers only modest cover from predators, and generally only small, quick creatures make it their home. The two largest creatures living on the heath are the Mole and the Rabbit, both of which live underground. In fact the Mole spends almost its entire life below ground, although it is not common on the heath due to the stony soils, which make tunnelling difficult. Other small mammals, like the Long-tailed Field Mouse and Field Vole, create extensive runs and burrows in the undergrowth, while the Pygmy Shrew prefers to use the runs of other mammals rather than build its own. All these small mammals have similar diets, feeding on insects, invertebrates, and a variety of plant matter. 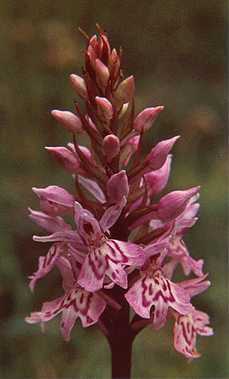 The heathland is also home to two reptiles, the Common (or Viviparous) Lizard and the Slow Worm. The Common Lizard can often be seen basking in the sun during warm weather, though it tends to hibernate in the winter when its staple diet of insects is in short supply. It can move very swiftly when disturbed, and can even 'lose' its tail to escape predators. The original tail will continue to twist violently after separation to divert a predator's attention, while the lizard will grow a new one in around eighteen months. The Slow Worm generally lives up to its name, being very slow and deliberate in its movements. However it can move with astonishing speed when necessary, and like the Common Lizard can lose its tail if threatened. It is very scarce in the Park, having many enemies, especially when young, when creatures like foxes, hedgehogs, frogs and some birds regard it as prey. With a variety of plants and insects to feed on, it is no surprise to find a good selection of bird species on the heath, although, like some insects, which birds will be seen depends on the season. Most resident heathland birds have adapted to the lack of tree nesting sites by building nests on the ground or in low shrubs and undergrowth. They must therefore be well camouflaged against predators, as in the case of the Partridge, Skylark and Meadow Pipit. By contrast the Skylark is very conspicuous in the air, having a distinctive call and high, hovering song flight. Other resident heath birds include the brightly coloured Yellowhammer, the Dunnock or Hedge-Sparrow and the distinctively marked Linnet, all of which nest close to the ground in low vegetation or shrubs. They may also be found in stands of coniferous trees, the Linnet often associating with Greenfinches and Goldfinches. Birds like the Pied Wagtail may be seen feeding on heathland and like those mentioned above, it too nests on the ground, though it often prefers holes in banks, cliffs or walls. The Bullfinch on the other hand nests in more wooded areas, but also seeks shoots and seeds on heathland. Species like the Winchat and Whitethroat can be found nesting on the heath, but they migrate in winter, mostly to Africa. They then return to the Park in April/May. The Wheatear is purely a bird of passage, favouring heathland and grassland. Many attractive species of butterfly, such as the Orange Tip, Brimstone, Small Tortoiseshell and Green Veined White, are often seen in the open areas of the park. Day-flying moths such as the Six-spot Burnet are also to be found. There still remains a good population of the Fox living in and breeding in the Park. The majority are becoming increasingly integrated with the urban environment, which enables them to take advantages of the opportunities and easier life this provides. Sutton Park foxes are able to commute between the urban and country environments with little danger to themselves by using railway lines and road systems as "wildlife corridors". The park is also surrounded by housing with large gardens and open spaces that provide food and shelter for the highly adaptable and opportunistic Fox, which takes full advantage of pickings from dustbins, and food left out for domestic animals, wild birds and the like. Breeding sites within the park are generally based on old rabbit warrens, where, with a little modification and excavation the Fox forms an earth. This consists of interconnecting tunnels with entrances, storage chambers, and at its lower depths a nest chamber. Mating takes place from mid December to early February, and the foxes' calls may often be heard at night. The vixen emits a wailing, eerily human cry, while the dog's call consists of short, clear yapping sounds. The cubs are born from early spring. They grow rapidly and soon put in an appearance on the surface, where they play and learn the art of hunting under the ever watchful eyes of their parents. The solid rocks of Sutton Park consist mainly of poorly cemented sandstones and conglomerates (rounded rock fragments) of Triassic age. These Bunter Pebble beds, known as the Cannock Chase Formation, underlie most of the park. They are thought to be a deposit laid down by a large river flowing from south to north and occur over a wide area between Worcester and Stoke. Below these rocks lies the Hopwas Breccia, angular rock fragments amid soft sandstones, which surface near Bracebridge Pool and in some of the tributary stream valleys in the park. In the same area, there appears a narrow strip of Hamstead Group beds, consisting of red marls and sandstones, which underlie both the Hopwas Breccia and Bunter Beds. This solid geology is overlain by glacial drift deposited by the ice sheets that invaded the West Midlands during the Pleistocene period. These left a thin skimming of boulder clay in the north and vast quantities of sand and gravel in the south, spread out by melt-water streams in front of the ice sheets. The deposits and the rocks beneath determine the type of soil which forms (e.g. whether it is fertile and well drained), and hence control the type of vegetation that develops. The boulder clays form sticky, waterlogged soils, while the sand and pebble beds produce very well drained, acid soils. 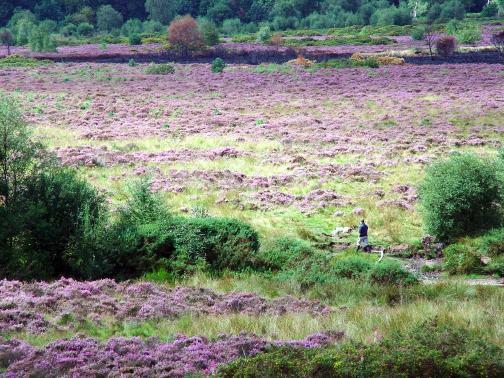 The valleys of Plants Brook and Longmoor Brook are well drained but due to hillwash and alluvial deposits are more fertile, though some of the valley floors are waterlogged, allowing the development of wet heath vegetation. Based on original web sites designed by Lynn Pearson and Brett Horton.